After permits and engineering, we are ready to meet to LAYOUT the pool. Pool LAYOUT is one of the first steps to pool construction. It is critical for you to see the size, location & shape of the pool and how it looks in your yard. This is your last opportunity to make “cost effective” changes to the pool size, shape or location within your property. Once layout is done and excavation starts, it can be quite challenging, and quite costly to move or make significant changes to the pool. There are many factors which affect pool layout, but we will layout the pool per our construction plans and the approved and permitted drawings. Minor adjustments can be made, but remember that we have spent a great deal of time and resources designing the pool to meet all of your needs, budget, and lifestyle. We are willing to make adjustments but that requires additional time and resources which will result in an additional cost to you. Our sincere advice to all homeowners is to invest time and careful consideration in evaluating the layout prior to “signing off” on the plans and allowing us to begin digging. The time you invest at this point can save you a great deal of money and help to avoid costly changes later in the construction process. “LAYOUT” – BRIEF OVERVIEW : The pool layout is usually done by one or two people. This process takes anywhere from 1 to 3 hours depending on complexity of the design. 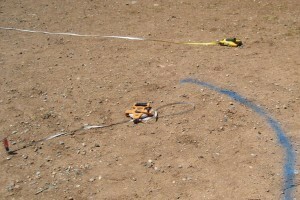 It involves the use of tape measures, string lines, marking paint, nails or pins, and miscellaneous tools. The layout man will be using a detailed CAD drawing which shows exact measurements, which are usually right down to the inch. Please expect some margin of error, but it is not uncommon to have your new pool laid out to “less than an inch” from our CAD plans. During layout, the pool is marked with paint and/or nails/pins to show you where your UNIQUE pool is going be built. This also helps to guide our excavation crew. It is CRITICAL to keep dogs and children from disturbing this layout. The pins help to preserve the layout in event of rain but can easily be removed by curious children or pets. Once the layout is complete, we will ask for your approval on the final size, location, and positioning of the pool. 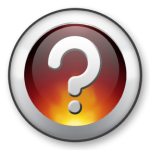 Please carefully inspect the layout and ask questions about any aspect which you are unclear about. This is the time to clarify questions or correct issues. If you decide to make actual changes to the layout, this can result in additional charges for labor and materials as well as changes to the original construction timeline as new or amended drawings might be required for permitting. Can I change, move, or re-position the pool? So far, we have ALL put a great deal of time and resources into designing and preparing for the huge investment you are making. With that being said, there are definitely costs involved in changing or moving the pool at this point. Even the slightest of changes can affect permitting, engineering, in-floor cleaning design and operation, construction costs and contracts, CAD plans, and overall construction time. Of course, with this being such an important decision, NOW is the time to make these changes to incur the least amount of additional costs possible. Changes after excavation or future phases can be double or triple the cost of changes made prior to excavation. Please consider all of these costs as well as the overall project, prior to making an on-site change. The pool looks very small after layout, can I make it bigger? During the construction process, there are always comments about a pool looking SMALLER at layout, BIGGER after excavation, and JUST RIGHT when it is finished. Before increasing the size of the pool, please consider this, and also consider the issues when changing a pool as described above. Increasing the size of the pool will definitely increase costs in all aspects of construction, but as mentioned above, it is much easier to deal with now. Is there anything I need to do to prepare for this project or the start of excavation? For the most part, we have everything under control but the following may be items which need your attention PRIOR to starting the heavy construction on your pool/spa. Kennel or secure your 4-legged loved ones. Upon start of excavation, we will need full access to the backyard. Dogs, cats and pets need to be secured inside or in an area which is away from pool construction for the safety of our crew as well as the safety and well-being of your pets. Many animals can become very agitated and stressed when there are loud noises and strangers on your property. Please consider this and how your pets will handle our presence. 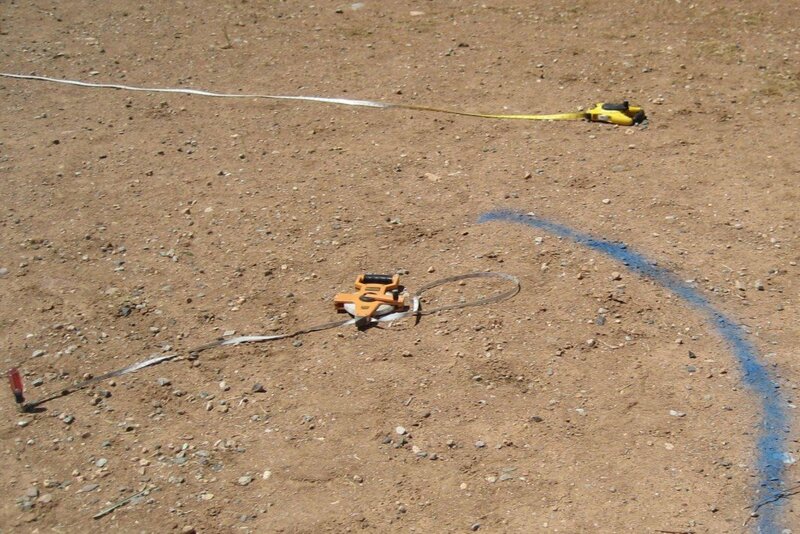 Mark, locate AND expose any underground lines that you do not want damaged. Remember, pool construction is major heavy construction, and if it is in the location of the new pool, then all underground lines, patios, and landscaping will definitely be damaged during this process. If our contract and agreement does not account for repair or relocation of these items, then you may need to make these arrangements prior to the start of the pool construction. If lines are marked and exposed, then we have the opportunity to work around them. Cover or Remove all patio furniture, toys, property, etc. – There will be many people coming in and out of your property over the next few months, please help us eliminate the possibility of accidental damage or theft by removing any furniture, toys or items that be temporarily relocated during the construction process. Finances – As you have been informed, the first 2 payments on the pool will be due within the first 7 to 10 days of construction. Our contracts call for a payment at excavation, which we will collect at our layout appointment or the day of excavation and at shotcrete, which will usually happen about 7 to 10 days later. Please make sure all your money is transferred and checks are ready to avoid any unnecessary delays in the construction of your pool. Landscaping – As you may know, we specialize in integration of landscaping, patios and hardscapes with our pools. If you have not finalized this part of your project, now is a great time meet with a UNIQUE designer as there are things that happen during excavation which are critical to the entire project. There are painted lines and flags in my front & backyard, what is this? Prior to starting any pool/spa or underground project where we use heavy equipment to dig, we are required to notify AZ BLUESTAKE. This service will locate all underground public utilities on your property. This allows us to see where these underground lines are, and avoid hitting them during excavation and construction. 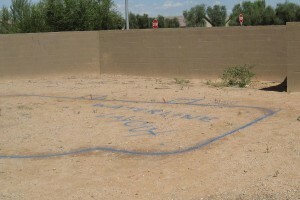 Although rare, there are occasions when we must move or shift the pool to comply with AZ Bluestake markings. I’ve got irrigation and some underground lines in other areas of my yard that bluestake didn’t mark. Did they miss them and how can I protect them? Bluestake only marks PUBLIC lines. Private lines are lines that are maintained by you and need to be marked by you. These may include but are not limited to irrigation lines, backyard electrical runs, underground gas lines which are after the meter and some sewer lines. 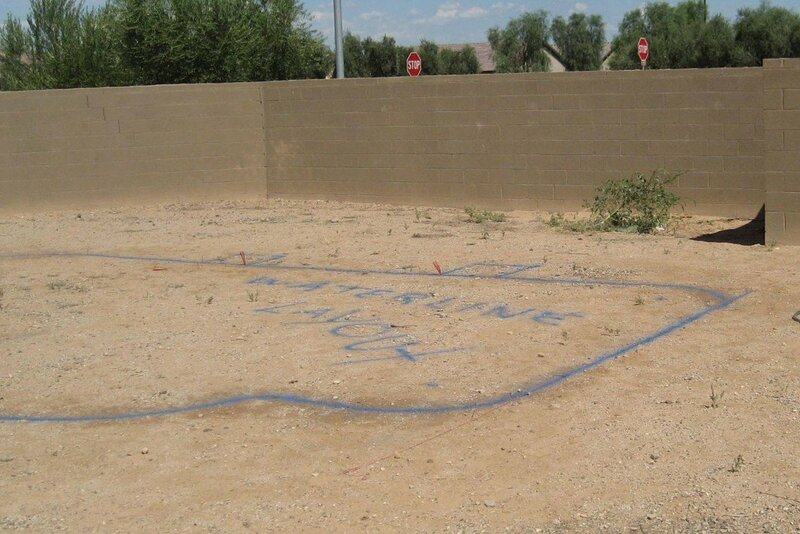 As contractors, we can assist in preserving these lines in some cases, but they need to be clearly marked and exposed by YOU prior to excavation. In most cases these lines which are in the direct path of the new pool or plumbing runs will be damaged, destroyed, or dug up. Any damage to these lines is unavoidable and the repair is not included in our standard pool contract/agreement. However, we will be happy to assist in the coordination & repair of these lines.